At Japari we develop leadership through our Monitor/Mentor Programme. Our grade seven pupils are required to provide a positive role model to the younger children, and in addition are allocated a number of important duties which they are required to fulfill. We have found this to be a wonderfully affirming process where our young men and woman in grade seven certainly rise to the occasion. Our Grade sevens have to carry out both monitor and mentor duties. Monitors are responsible for a number of very important areas of the school. These can be from assisting at line up, duties in the sound team, scholar patrol, first aid team, library; to welcoming and escorting guests at official school functions. As a mentor our grade sevens are also responsible for a number of younger children, in a class. They are required to meet their children on a regular basis and solve, to the best of their ability, any concerns or problems that these children may have. Mentors are distinguished by the braiding on their blazers. The Japari staff assists and supports the mentors by amongst other things, conducting mini-counselling sessions on a regular basis. Our Grade sevens attend a leadership camp at the beginning of the year, where they need to complete a series of tasks which test and challenge a number of areas such as, amongst others, communication, ability to work in a group/team, planning, negotiation and problem solving. These are all important skills our leaders will need as they take on their official monitor and mentor duties. These duties are only relinquished at the Grade seven Valedictory Service at the end of the year. Our Grade six children support the Grade seven monitors and mentors when they write their final academic examinations. At this time, the Grade sixes assume the required duties as the Grade sevens need to focus on their studies. This is good training for the Grade sixes as they will need to officially assume these duties the next year. Our Grade seven year at Japari, is a year of personal growth and development. The monitor/mentor leadership programme is challenging and demanding. Our Grade sevens, through accepting and facing these challenges, grow and mature. A number of grade sevens present speeches at their Valedictory Service, and parents are often amazed at how their children have matured and developed during the year. 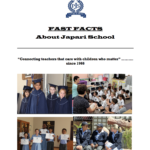 Each grade seven compiles a Powerpoint presentation at the Valedictory Service which, in conjunction with the groups Scrap Book, encapsulates their time at Japari School. Grade seven scrapbooks can be viewed in the school’s administration foyer, and the Powerpoint presentations can be found in our annual magazine.